PennsylvAsia: Vietnamese coffee with Art Labor, a Ho Chi Minh City-based artist collective, October 13 at CMOA. Vietnamese coffee with Art Labor, a Ho Chi Minh City-based artist collective, October 13 at CMOA. 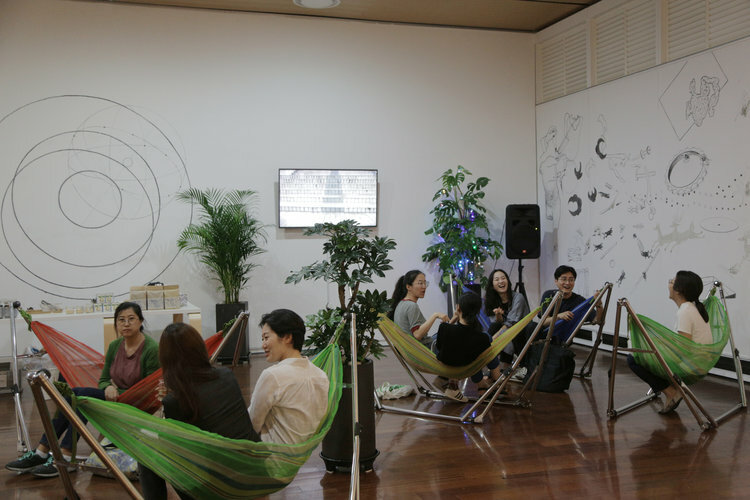 Hammock Café in Seoul, via artlaborcollective.com. As part of the opening celebration for the 2018 Carnegie International on October 13, the Carnegie Museum of Art will host Vietnamese coffee with Art Labor, a participant in this year's exhibition. Jrai Dew hammock café is part of Art Labor’s long-term project ‘Jrai Dew’, which projects critically the cost of capitalized world through mythic narratives. It takes inspiration from Jarai belief in the human and the cosmos. In their philosophy, being human is a part of the metamorphosis cycle of the nature. After death, the journey going back to their origin ends at becoming dew (ia ngôm in Jrai language) evaporating to the environment – the state of non-being – the beginning particles of new existence. In this metaphorical context, forestland with its people is the vanishing dew, while new existence of modernization and industrialization arise. By using products and symbols that either belong to the Central Highlands of Vietnam or related to the violent changes in history, Jrai Dew leads to a scene of human chaos however in a poetic and dreamy way. The event is held in the Heinz Gallery C from 11:00 am to 1:00 pm and is open to those who purchased museum admission. The museum is located at 4400 Forbes Ave. in Oakland (map), accessible by buses 28X, 58, 61A, 61B, 61C, 61D, 67, 69, 71B, 71D, 75, and P3.